"Ticket - Seattle Supersonics - October 15, 1990." 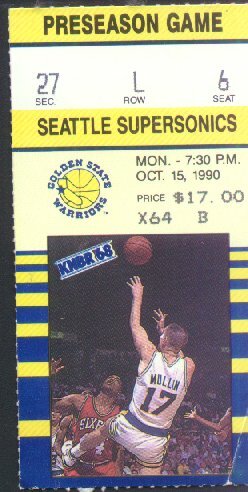 (1503) Ticket - Seattle Supersonics - October 15, 1990. -Condition: Good Plus Ticket was for a preseason game. It was for section 27, row L, and seat 6. Bottom right corner has a crease. Has a photo of Mullin jumping for the ball. Ticket measures 2" by 4". Price: $4.00 + shipping.